This book is open access under a CC BY license. 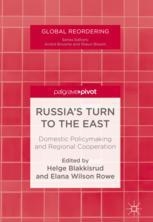 This book explores if and how Russian policies towards the Far East region of the country – and East Asia more broadly – have changed since the onset of the Ukraine crisis and Russia’s annexation of Crimea. Following the 2014 annexation and the subsequent enactment of a sanctions regime against the country, the Kremlin has emphasized the eastern vector in its external relations. But to what extent has Russia’s 'pivot to the East' intensified or changed in nature – domestically and internationally – since the onset of the current crisis in relations with the West? Rather than taking the declared 'pivot' as a fact and exploring the consequences of it, the contributors to this volume explore whether a pivot has indeed happened or if what we see today is the continuation of longer-duration trends, concerns and ambitions.